A New Ancient Egyptian Tomb with Typical Funerary Scene Discovered. Ancient Egypt gives us again a good document. The tomb of Amenhotep, the Gater’s keeper of god Amun, has been discovered in Gourna. Although it is still too soon for seeing the whole decoration, some images of the walls can help us to imagine how could be some complete scenes. This is the case of a part of the funerary procession, which can be seen on the right wall of the funerary chapel. Walking to an image of the ancient Egyptian god Osiris there is a depiction of a typical funerary procession of Ancient Egypt: In the upper register two oxen with ropes attached to their horns are moving forwards the West, one man stimulates the animal with a kind of branches (a natural whip), some men are holding the rope, two men are raising their arms, another one is burning and pouring; behind him there is a standing man with a long stick and dressed with a kind of shroud. 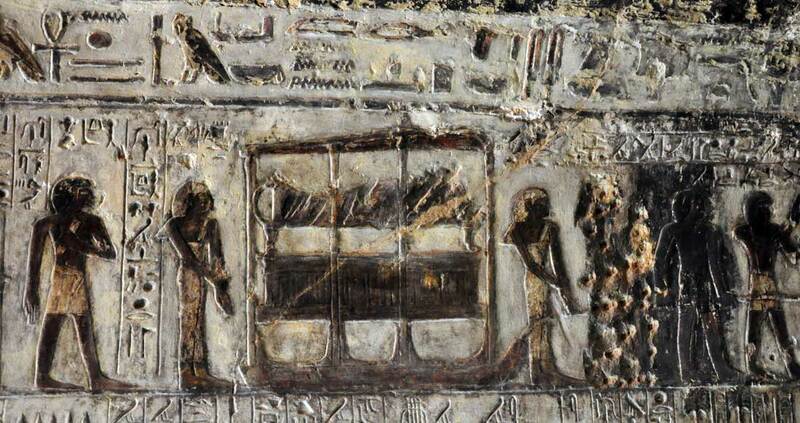 In the second register there is also a typical scene in a funeral of Ancient Egypt: the porters of the funerary objects. 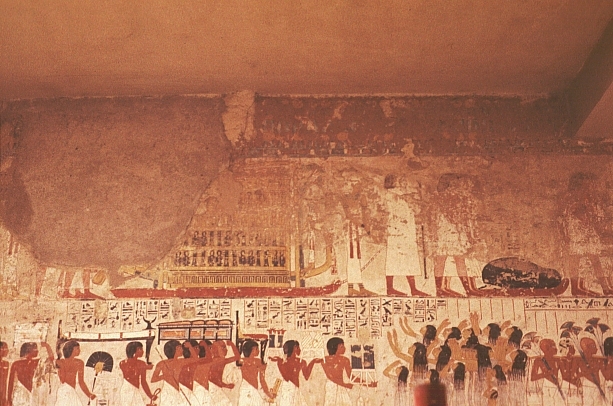 This scene shows the ancient Egyptian funerary procession to the necropolis. The last masculine figure we can see in the upper register was, according to S. Hodel-Hoenes, the priest of Sokar (Sigrid Hodel-Hoenes, Vita e Morte nell’Antico Egitto, Milano, 1997, p. 127). This is a common scene in many ancient Egyptian tombs of the XVIII Dynasty and usually the priest of Sokar was followed by the coffin accompanied at both ends by the two professional mourners in the role of Isis and Nephthys. The best examples are in the tomb of Ramose, the tomb of Rekhmire, also in Gourna, or in the tomb of Pahery in el-Kab. So, we could consider that the scene of the funerary procession of the tomb of Amenhotep, the Gate’s guard of god Amun, follows with the image of the corpse and the two mourners or Drty, which in funerals of Ancient Egypt made a mourning rite for granting the dead’s resurrection. Young Girls with Common Mourners in Ancient Egypt.